Florida is one of only four states where texting while driving is a secondary offense. This means that a police officer cannot pull over a driver solely for texting while behind the wheel. They need to be committing another traffic violation (e.g., speeding, tail light is out, not wearing a seatbelt, etc.) in order to pull them over legally. State Representative Emily Slosberg (D-Boca Raton) is seeking to change that. She wants to make texting while driving a primary offense which would allow police to pull over a driver if they see them texting and driving. 2,333 people ages 16 to 19 died in car wrecks in 2015 alone. That same year, approximately 221,313 teenagers were treated in emergency departments for car accident injuries, according to the Centers for Disease Control and Prevention. In Florida, traffic-related deaths increased by almost 18 percent in 2015. If that was not bad enough, teenage driver deaths increased close to 30 percent in 2015, according to CBS Miami. In 2015, approximately 3,477 people were killed in collisions involving a distracted driver. That same year, approximately 391,000 people were injured in wrecks involving a distracted driver. Studies have shown that texting and driving is comparable to driving while under the influence of alcohol. This is primarily due to the delayed response time of a driver who is distracted. 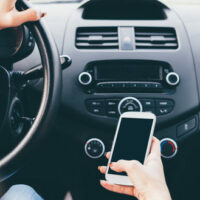 One prominent study featured drivers using a mobile device while driving and found that the driver’s attention was diverted for five seconds each time they looked down to check their phone. To put that into perspective, if you are travelling 55 mph, a five second delay is enough time to drive the length of an entire football field. Representative Slosberg has tied to make texting while driving a primary offense in the past. She proposed a prior bill that would have made texting and driving a primary offense for drivers under the age of 18 and when a driver is texting behind the wheel in a school zone. Unfortunately, the Florida Legislature did not approve the earlier bills, but that has not deterred Representative Slosberg. Representative Slosberg has been pursuing stronger texting and driving laws for personal reasons. Her twin sister died in a car wreck in 1996 after a 19-year-old driver decided to travel 90 mph in a 50 mph zone. The teen driver’s car hit a median and slammed into Slosberg’s vehicle. Representative Slosberg survived, but her sister did not. Representative Slosberg intends to get all 67 counties to pass resolutions supporting her texting and driving proposal. If that is accomplished, she then hopes the change will pass in the House and the Senate and be approved by the Governor. If you or a loved one was hit and injured by a distracted driver, speak to the experienced Miami car accident lawyers of the office of Alan Goldfarb, P.A. We are eager to assist you with your case.